The river trip was extraordinary! The boat was some sort of power barge, with people squeezed inside four-abreast sweating, or perilously balanced on the roof, burning! At least those on the roof didn’t need to endure a constant looped barrage of Japanese Karaoke, subtitled into Korean, dubbed into Khmer (Cambodian), and lustily sung by everyone barring me in the cabin (around sixty travellers). It was painful!! After six hours of this we landed close to Siem Reap, and transferred into tiny fishing boats. An hour of very serene chugging brought us to the harbour; a muddy, dead-fish strewn slope that stank unbearably in the 40+ degree temperatures. It was wretched! Thankfully there was a taxi driver waiting for me. This was both surprising, as I didn’t order one, and unsurprising, as I’d already met his cousin in Phnom Penh. He promptly took me to a hotel of his choice, and then to the hotel of my choice when I refused to pay him, crying over his steering wheel all the way! 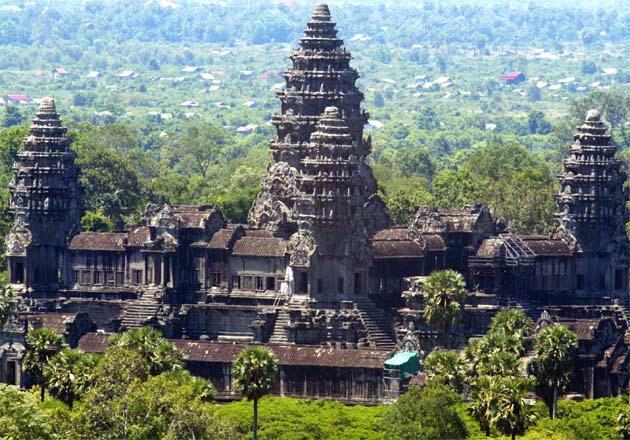 Welcome to Siem Reap. This place is nice and laid back. 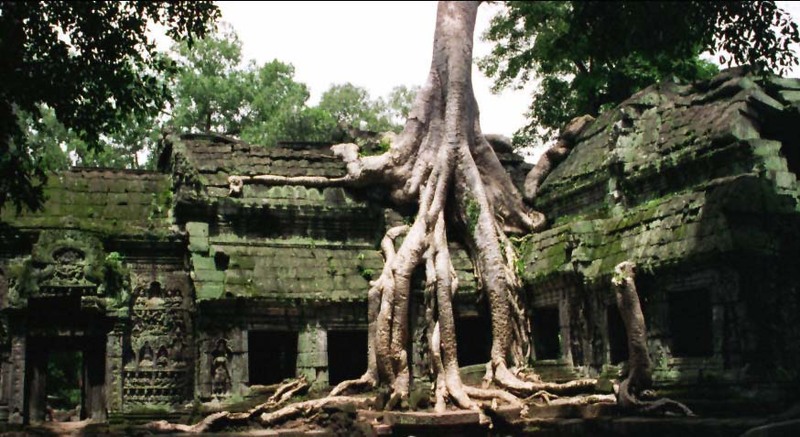 Surrounded by the most fantastic ‘temples’, Siem Reap is the perfect base for a relaxing exploratory break. Once you’ve got there, and as long as you don’t mind a lot of clambering around, you’ll be well rewarded by the countless stone sculptures, friezes and buildings. 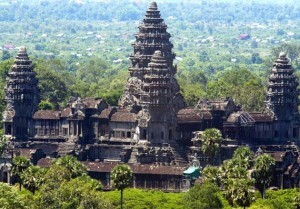 The accompanying picture is that of Angkor Wat, which is possibly the most well known of the Khmer ‘temples’. Temple is perhaps the wrong term; maybe palace would fit better, as they were built more for the Gods than mortal people. “Mountain” fits more closely however, the idea of which makes much more sense when you considered the peaks of these fantastic places poking out of the undergrowth of the perfectly flat surrounding countryside.